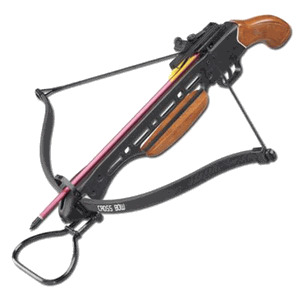 The Hunters Short Stock Crossbow 150lbs features a potent 150 lbs draw weight. The wooden fiberglass resin stock is sturdy with a matching forward grip. Arrows are launched at speeds of 210 feet per second. The foot stirrup makes it easy to use. The fiberglass prod is reinforced with steel shielding for reliable and consistent operation.